One of the beautiful villages on the wistful network of creeks off the Fal river, Mylor has long been connected with shipping. In days gone by it would have been packet ships bringing trade here, but now it is the heart of a yachting and pleasure craft paradise. 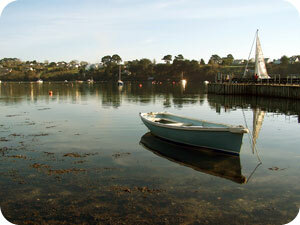 Where Mylor Creek joins the River Fal and Carrick Roads is Mylor Yacht Harbour. The marina is well equipped with plenty of facilities including 400 berths. A haven for shipping for 200 years Mylor was at one time the most westerly Naval Dockyard and victualling station in England. The harbour went on to become home to the notorious HMS Ganges and the Falmouth Packet ships. During World War II the harbour was a base for operations conducted by the French Resistance. It is now home to the last remaining fleet of oyster fishermen. In nearby Restronguet, the thatched Pandora Inn has many a tale to tell. The Inn was once owned by Captain Edwards (a nasty peice of work by all account) who brought the HMS Bounty mutineers to justice - the name comes from the frigate HMS Pandora which he sailed to Tahiti to hunt the mutineers down. The inn is charmingly placed at the water's edge with its own pontoon. Those who can, arrive by boat! There is nothing more magical than discovering beautiful and tranquil places in Cornwall. Secluded on the Carrick Roads Estuary at Mylor Harbour is a hideaway you will never forget. Castaways a Seafood Restaurant offer a perfect blend of quality seafood, affordable tapas and great wine. With stunning Views across Carrick Roads. There also stunning Coastal walks to enjoy. Flushing is a small fishing Village that overlooks Falmouth from its position accross the Penryn River Fal, it has two lovely pubs, and country walks. Also it own beach called Trefusis, you could walk from Bay view to Flushing and then finish up in Mylor with stunning creek views all the way.